We passed very early you and will return at 3:00 pm. approximately. 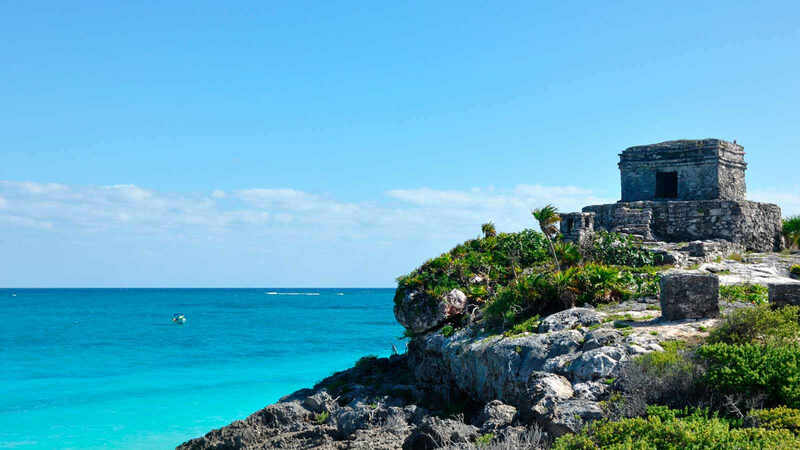 Tour to the ruins of Tulum noon from Cancun is excellent for travelers who want more activities the same day, we take you to meet the unique archaeological site located on the Caribbean Sea, Tulum best known for his Wall, where we will to walk in the old paths as did the Mayan priests. Explore and discover the secrets of the castle and the Temple of the Frescoes, buildings that stand out for their preservation and the high quality of the wall that still remain in the interior of both paintings. After the tour with our guide will have time to enjoy a cool dip in the warm, clear waters of the Caribbean Sea on the beaches of Tulum, recognized by Word Travel Awards as one of the best beaches in the world. Pick Up from 7: 00-7: 30 am. Hotels in Cancun (Center and Hotel Zone). Return to their hotels, approximately at 3:00 pm. Trucking Hotel - Tulum - Hotel. $ 54.05 $ 47.00 Adults. $ 54.05 $ 47.00 Juniors 5 - 10 Years.